It was 14 degrees below zero at the homestead this morning, which made leaving the wood stove difficult again today. Except, it was great to get out and see what a gorgeous day it is. 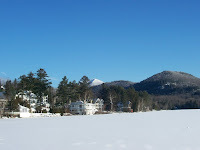 Today's photo was taken from the corner of Mirror Lake Drive and Main Street, from the boat dock behind 1 Main Street, in the Village of Lake Placid. This multi-use, lovely Adirondack property is for sale and makes a great investment opportunity for a savvy investor!